Ergo Rolling Pins :: Handturned Rolling Pins. The Ergo's handles are designed to contour to your fingers, making rolling stress-free. It's made for hard-working bakers and cooks who deserve to have their hands pampered. Available in thin and wide barrel styles. 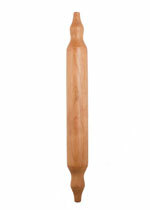 The wide Ergo rolling pin as seen in Cherry. Approx. 2 3/8" in diameter and approx. 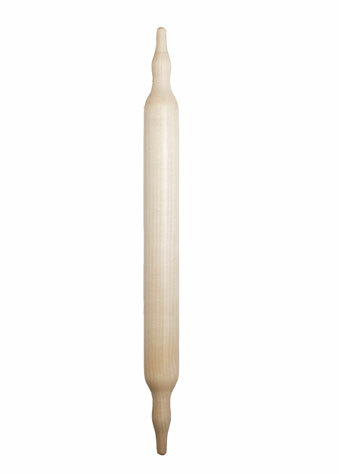 20" in length, barrel rolling area is approx. 13” long. 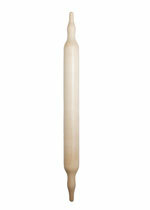 The thin Ergo rolling pin as seen in Maple. Approx. 1 3/4” in diameter and approx. 20” in length, barrel rolling area is approx. 13” long. © Copyright 2009-2018 Vermont Rolling Pins, LTD. All Rights Reserved.